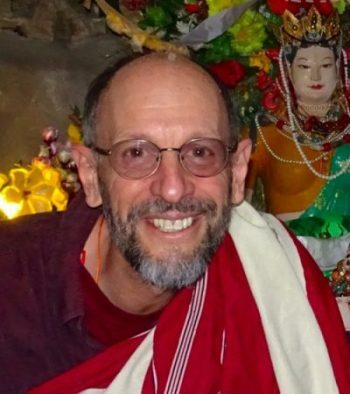 Please join us for a rich weekend of teachings from Lama Mark Webber on the essential topics of understanding Bodhicitta, Emptiness and Tonglen (Sending and Receiving). These teachings are open to all. The Lama gives his time & wisdom freely. Please give as generously as you are able. General: Bring your lunch for the weekend sessions if you wish. Bring pen and paper for notes. Tea/coffee and water is available in the centre kitchen. Friday Evening, March 30, 7-9pm: Teaching, explanations and meditations on the nature of Bodhicitta, the union of compassion and emptiness. Bodhicitta is the search for primordial wisdom, the enlightenment mind. Lama Mark gives a talk on this most important aspect of all Buddhist teachings and meditations, including understanding the vast view of emptiness. Saturday morning, March 31, 9:30am—11.30am: Reading transmission of Khunu Lama Gyaltsen’s 356 verses in praise of Bodhicitta, The Jewel Lamp1. Bodhicitta is infinitely vast and astounding in its manifestations, yet has a singular nature of complete wisdom mind. In order to illuminate this natural quality for meditation and realization, Lama Mark will give a reading transmission of the 1959 text, The Jewel Lamp, composed by Khunu Lama. Saturday afternoon, March 31. 2:30 — 4:30 pm: A reading transmission of the Praise to Mañjuśrī (Gang-lo-ma), with some brief explanation. Followed by commentary, explanations and meditations based on selected verses of the Jewel Lamp, verses in praise of bodhicitta from the morning’s reading transmission. Sunday Morning April 1. 9.30-11.30am: A group meditation session of Tonglen (giving and receiving). Tonglen is taught and practiced within all schools and lineages of Tibetan Buddhism. It is a profound yoga and at the heart of most sadhana practices. Questions and answers regarding this practice. Sunday April 1, 2.30- 4.30pm: The weekend of teachings will finish with a reading transmission of Je Gampopa’s Precious Garland of the Sublime Path2. This text, composed in the 11th century by one of Tibet’s greatest masters, is 28 sections of pithy advice to all Vajrayana practitioners. Not only are the text words of enlightened guidance, but it contains the most essential pith instructions for Mahamudra practice and every aspect of life’s journey as a spiritual being. Lama Mark will give detailed commentary, especially of some difficult to understand passages. Included will be a brief, integrated summary of practices for all Vajrayana practitioners, recently written by Lama Mark. Available as: Vast as The Heavens and Deep as the Sea, verses in praise of bodhicitta. Khunu Rinpoche, Wisdom. Boston.